Silhouette InstaLift is a technique that lifts and repositions mid face skin with minimal downtime. 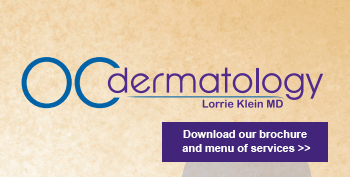 Utilizing dissolvable threads and local anesthesia (lidocaine), Dr. Klein can safely and comfortably redrape your skin to create a more youthful look. Dr. Klein is one of the first physicians in Orange County to perform this advanced technique. While Botox, fillers and lasers address many issues caused by aging and sun damage, until now there was no minimally invasive, non-surgical solution to lift the deeper tissues of the face. InstaLift can be performed soon after or before these other treatments and works synergistically with them to create a refreshed, natural, more youthful appearance. Silhouette Sutures are full resorbable, biodegradable PLGA (Vicryl) sutures with resorbable anchoring cones made of the same material that Sculptra is made of which stimulate collagen synthesis in your skin for additional benefits. Treatments last 20-40 minutes. First we numb you with lidocaine using a tiny needle which you will barely feel. Depending on your face, 6 or more threads will then be inserted to create the best look possible. After your treatment an enhancement may be desired to “fine-tune” your results, but is usually not necessary. After treatment, some common, temporary, treatment-related reactions might occur: swelling, bruising, tenderness, mild pain, slight depressions or skin irregularities. If any of these occur, they typically resolve within a few days but occasionally can last up to 7-10 days. See our informed consent for a list of risks. As these threads and cones safely resorb over time, results last approximately 2 years. IMPORTANT– Make sure you wash your face thoroughly before your treatment, including removing lipstick. To reduce the risk of bruising and swelling you should avoid blood-thinners, aspirin, ibuprofen (Advil), naproxen (Aleve), Vitamin E, fish oil (omega fatty acids) and similar meds for 1-2 weeks before your treatment. Arnica Montana pills taken 1-4 days prior to your treatment help reduce bruising and swelling and may be continued for several days after your treatment. Strong versions are available for purchase at our office. Apply cold packs 5-10 minutes at a time, for 1-2 hours after your treatment. Acetominophen (Tylenol) may be taken for pain, if needed. Avoid washing your face and avoid makeup on or near the injection sites for 24 hours. Apply Aquaphor to blue dots 2-3 times a day for 1-2 days. Dots will disappear on their own in a few days, do not scrub them. Wash, dry, shave and touch face gently for 5 days. Avoid high-impact sports, yoga and heavy exercise (such as running and weight lifting) for 2 weeks. Walking and light exercise is okay. Avoid excessive facial expressions, including chewing gum and hard foods for 2 weeks (eat soft foods). Avoid dental work, facials and putting your face in a massage face cradle for 4 weeks.